It’s a little embarrassing, but i quite often find myself being spoken to in Korean. It’s hilarious… for that split second, i get to see that twinkle in a complete stranger’s eyes as they make a gesture towards me as they would a familiar face before launching a barrage of Korean at me, only to blush apologetically when they realise I don’t have the slightest clue what they are on about. Jo tells me its my almond-eyes that fool them… Sigh, I might just pre-emptively learn how to say ‘i don’t speak Korean‘ in the language in anticipation of the the next time I get given the Korean menu at a restaurant or stopped on the roadside by a lost tourist. 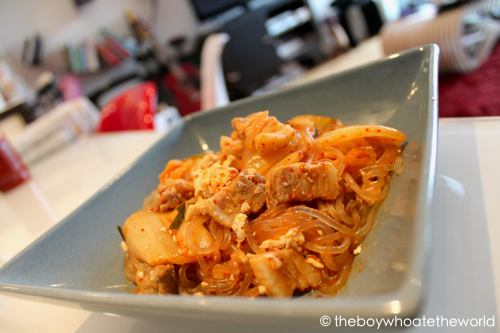 Anyhoo, as a tribute to the land that continues to mistake me for one of their own, here’s one of my absolute favourite staple Korean dishes I turn to in order to satisfy those kimchi cravings. It’s dead easy to whip up at home and if you have a thing for kimchi, or all things spicy and sour, this dish will be right up your street. 1) Soak the glass noodles in cold water for 20 minutes. This will give the noodles that soft yet springy texture that you simply won’t get if you boil the dried noodles in hot water straight away. 2) At the same time the noodles are soaking, marinate the pork belly in a simple marinade of sesame oil, soya sauce, salt and pepper. 3) Heat the vegetable or groundnut oil in a large lidded pot, and stir fry the pork belly slices with onions and garlic for 5-7 minutes under a high heat. 4) Now, add the Kim Chi and Chilli bean paste, then reduce the heat down to a medium simmer and cover the pot for a further 8-10 minutes. 5) While the pork and kimchi mix is simmering away, cook the glass noodles in boiling hot water for 5 minutes, then drain, placing the colander in a bowl of cold water. 6) Now, add the beancurd and drained glass noodles into the pork-kimchi mix and cook for a further 2-3 minutes, adding hot water to loosen the dish if the noodles start to become overly dry. Mix lightly, trying not to break the beancurd into overly small pieces and serve while still piping hot. An nyoung ha seh yo Korea – this one is for you. I laughed when I read your Korean anecdote. Happens to me all the time when i’m around Tower Hamlets (but with Bengali people instead). Congrats on your new purchase, those 600’s are packed full of some pretty nice technology. Louis: My sisters (we’re all Malaysian-Chinese) used to joke when I was younger that I was adopted just to scare me into tears. Maybe they weren’t kidding after all ;P. Btw, love the food photography on your blog. Still a noob with the DSLR and still have a lot to learn. Thx for stopping by! Ooooh new camera! 😉 Very nice. Suyin: Been wanting to upgrade for some time now but just never got round to it! Still have yet to learn how to use it properly though… I’ll be happy if i manage to take photos half as nice as yours’!